I think Marvel were taking a risk when choosing what films to feature in “Phase Two” of the comic-book adaptations. The series they ended up funding, to some fans’ dismay was the little heard of (in comparison to the other brands) Guardians Of The Galaxy. This was a chance to really push the boat out. Most of the previous adaptations such as Thor and Iron Man had to one extent or the other, a large fan base; be it from the numerous cartoon series or the shoddily made pre-Marvel films or even, the comic-books. This was a chance to have a blank slate for everybody. How will a team consisting of a chubby comedian, a walking tree, a wrestler, an assassin and a raccoon (voiced by arguably their most bankable star) fare? To be quite honest with you, this might match up with the dizzying standards set by The Avengers film. 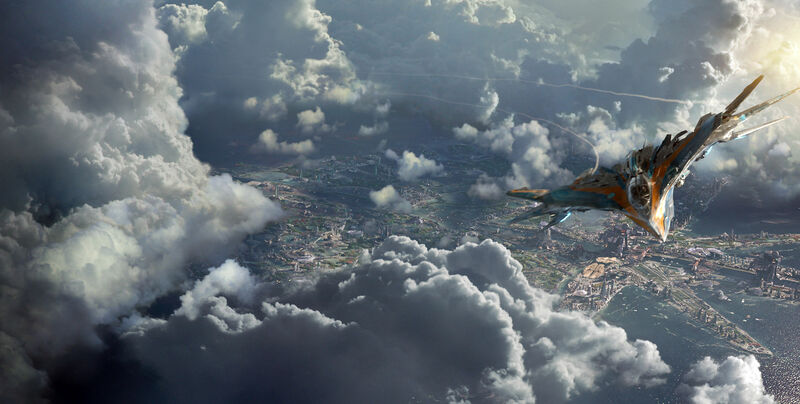 Guardians of the Galaxy is goofy, and always takes on a scene with a half-wink. The film largely follows the story of Peter Quill (Pratt), a child from the 80s who gets abducted by alien bounty hunters. 28 years later, Quill, now known as Star Lord, is caught red-handed with a dangerously valuable artifact and escapes with the vicious Gamora (Saldana), sarcastic Rocket (Cooper) and his companion Groot (Diesel) hot on his tail. Each of the main characters seem to add something interesting to the story. Peter Quill is like a petulant man-child, having no one tell him what to do from a young age, for example, flipping off while in a Usual Suspects-esque mug shot. While fans may be disappointed that Bradley Cooper plays such a behind the scenes role, they should not be upset as his character Rocket almost steals the show as a mordant, volatile android raccoon (but don’t call him one to his face). If audience members hadn’t seen the credits, they may not have even guessed who he was with his strongly slathered “New Joizey” accent. Alongside slow thinking but gentle tree-creature, Groot, they may be the best Marvel pairing so far. Little in-jokes start to appear as we soon realise that Rocket is the only one who can decipher what Groot says (his cognitive capacity limits him to the phrase “I am Groot”) and their almost brotherly squabbling makes their unconventional chemistry almost identical to the Han Solo/Chewbacca partnership. Possibly the most surprising casting belongs to wrestler Dave Bautista who plays the brooding Drax the Destroyer . Obviously there would be strong comparisons with Dwayne Johnson but having no previous acting experience it gave some fans worries. What we get from him however is pretty layered, he shows different sides to the character that kind of balances out the laddish attitude of Quill. Often feeling sombre due to his past, it is later pointed out that he understands everything literally which is exploited to the full by Dave. The only problem with his character is that for the most part, we don’t get a lot of character development outisde of the fact that he wants to avenge the death of his family. It gets to the point that he repeats that specific timeline to the extent that his development is stagnant. Gamora (Saldana) is an intriguing character. Step daughter of the mysteriously powerful Thanos, her backstory is littered with possible plots that director and writer, James Gunn could have taken for her but for the most part, they are unused. She is strongly self-guarded, due to her family issues with fellow step sister, Nebula (Gillan) but is strangely likable. She is one of the few characters in whom I would happily go and watch an origins movie of. GOTG is for the most part, a love letter to 80s movies. It has elements of Star Wars and Indianna Jones with a lovable rogue as the leading character and in one particular scene, Thanos has a video message to one of his conspirators that doesn’t even subtly reference the messages between Darth Sidious and Darth Vader. The soundtrack may be one of the best out of all the Marvel films, I challenge you to find me an equal. The songs that are used actually play a narrative role in the movie. Peter Quill is gifted with a cassette tape of his mother’s favourite music and after being abducted, he lives off artists like Blue Swede (OOKA CHAKA) and David Bowie as his only memories of Earth. Some of them may be cheesy, but it allows us to get into the headspace of Peter and change the image of him from a spoilt brat with expensive gadgets to a kid that wasn’t taught to grow up. I even found the gag of Quill wearing a pair of old 70s headphones juxtaposed with hologram gear and jetpack boots as mildly amusing. The large problem with GOTG, as with most of the Marvel films is the really dire lack of character development for the villains. 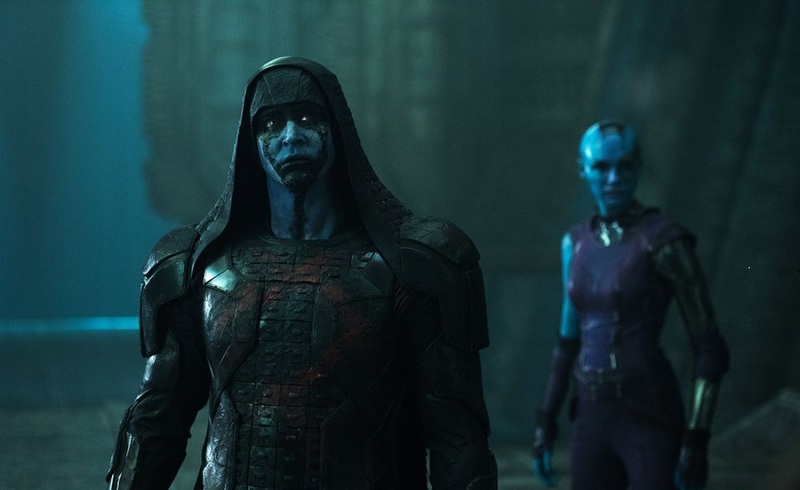 The main antagonist is Ronan the Accuser (Pace) who is hellbent on destroying this planet, the Guardians have to stop him and this takes up a lot of the plot. But why?! We are never given a chance to understand what makes him tick/motives and he is given little dialogue outside of the generic, “I will crush you/ destroy you/ slaughter your family!” spiel. For the first half of the film, he is like a glorified delivery boy to Thanos and then half-way through the film almost, he tries to become this imposing behemoth that strikes fear into people but fails in doing so. Maybe he is a massive d*ck but what we do see of him is largely murky. Guardians of the Galaxy maybe Marvel’s passion project. With a shameless announcement at the end inferring a sequel is in the works, it is very likely to return to our screens soon and this time, it may have some die-hard fans to greet it. P.S. That post credit scene was ridiculous! What did you think of the film? Let me know in the comment section below. Good review Adam. Had a very fun time with this that I wouldn’t mind checking it out again.